Yes, I have a cat, but I'd like a dog. Yes, one brother and two sisters. That's my brother over there. No, I've been here before with my family. 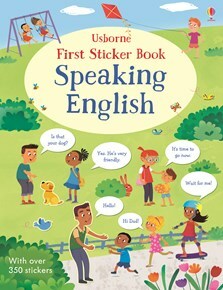 Learn over 100 useful English phrases with this sticker book full of familiar scenes such as buying food, going to school and introducing family. With 350 stickers of pets, food, toys and more, plus 200 speech bubbles to add to complete the conversations on each page. Ideal for children learning English as a second language.